Updated Apr 2018. Originally posted Nov. 2016. Meal prepping a bit at a time has been such a game-changer for me (See how I Meal Prep in Minutes here). 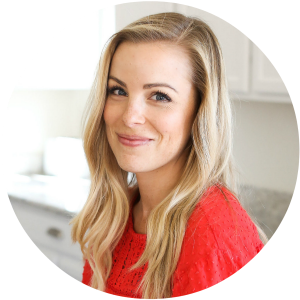 I don’t plan every single breakfast, lunch, snack, and dinner for the week, but focusing on just a few things helps me stick to a plan, use what I’ve bought, and not have to worry about what we’re going to eat when mealtime rolls around. Two areas I often focus on are snacks and lunch. I’ve got a bunch of snack ideas on the blog, but I always love sharing ideas for lunches. 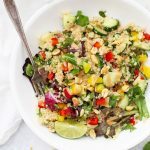 This Spring Roll Quinoa Salad is an AWESOME option for meal prep. It’s perfect for enjoying at home, but can also be packed ahead in mason jars for a quick and easy on-the-go lunch. Let’s jump in, shall we? Consider this a deconstructed (and protein boosted!) version of one of my favorites–spring rolls! I started with a base of quinoa (with 7-9g protein per serving), then added some fresh herbs and a splash of lime juice and sweet chili sauce to wake things up. 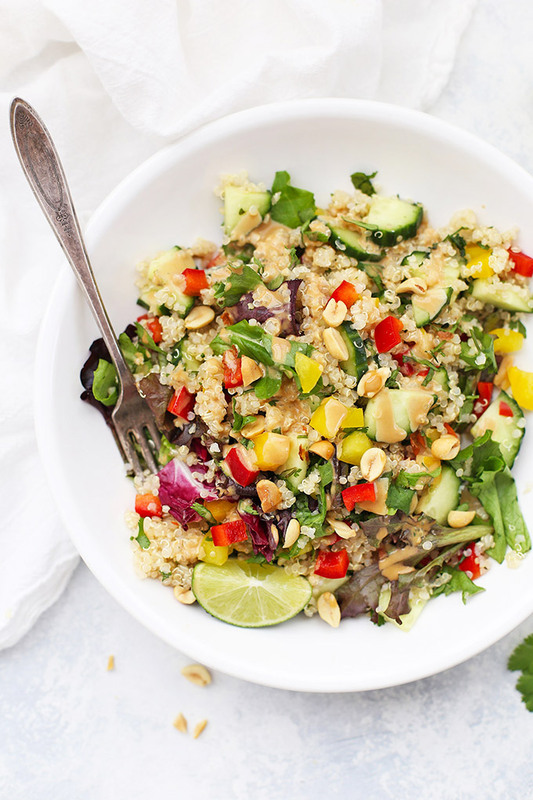 I love using quinoa for make-ahead lunches since it holds up so well and there are SO many different ways to flavor and enjoy it. It was the perfect base for this salad. Next, I added some color through bell peppers and some spring mix (though baby spinach or power greens blends are also fabulous). Lastly, I tied it all together with a creamy coconut peanut drizzle in place of the peanut dipping sauce you’ll see with spring rolls. The flavor is FANTASIC. Each layer, from the quinoa to the crisp veggies, to the creamy peanut sauce is absolutely delicious. It’s definitely one you’ll want to toss into the regular rotation! Change it up! Feel free to add other yummy add-ins to this salad. For a non-vegan version, some shrimp or chicken is delicious. Or, you can add in goodies like avocado or mango to brighten things up a bit. Allergic to peanuts? You can sub sunflower seed butter, almond butter, or cashew butter. Or, just leave it off. 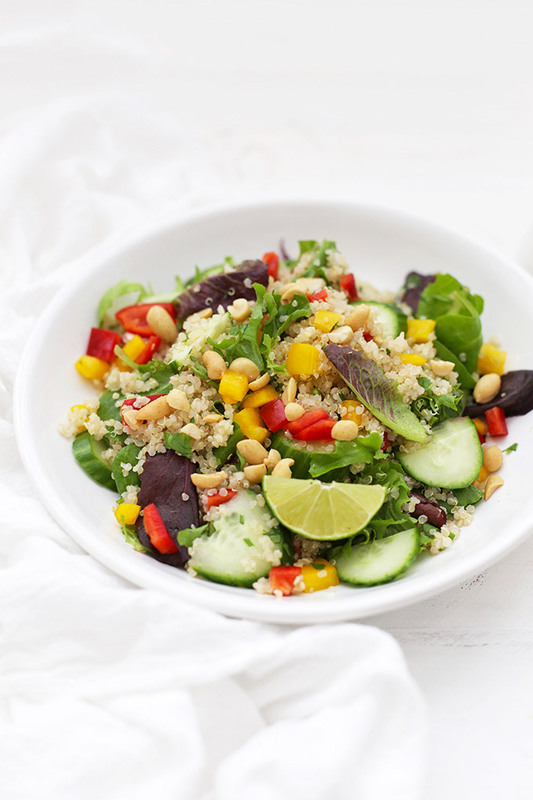 The salad is still delicious without it, though you may want to add a bit of extra sweet chile sauce to your quinoa. Gluten free? Be sure to use gluten free tamari or coconut aminos for your soy sauce option. Traditional “soy sauce” is usually made of wheat these days. Let’s Talk Coconut Milk. To keep the coconut sauce from being too thick, I used So Delicious coconut milk (found in cartons in the refrigerated section). It’s got all that lovely coconut flavor while still being easy to pour and a bit lighter. I love it for sauces or smoothies (like this one). If you use canned, I recommend going with the “light” kind (one of the only times you’ll hear me say that!). Mix It, Blend It. Especially if you’re using a natural peanut or nut butter for the drizzle, you may find it doesn’t blend right away. Don’t panic! That’s just because it doesn’t have “extras” in it that stabilize it. You can just keep whisking, warm it a bit in the microwave to help it along, or just toss your peanut drizzle ingredients in a blender or use an immersion blender (my favorite) to get the job done. Your choice! Not a cilantro fan? No worries! Feel free to swap it out for some fresh basil. It’s just as delicious. 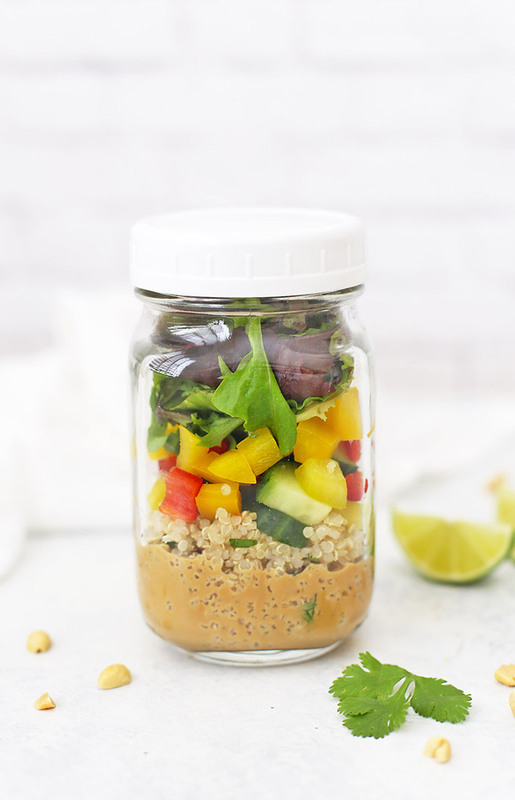 To pack in a mason jar: put the peanut sauce at the bottom of each jar. 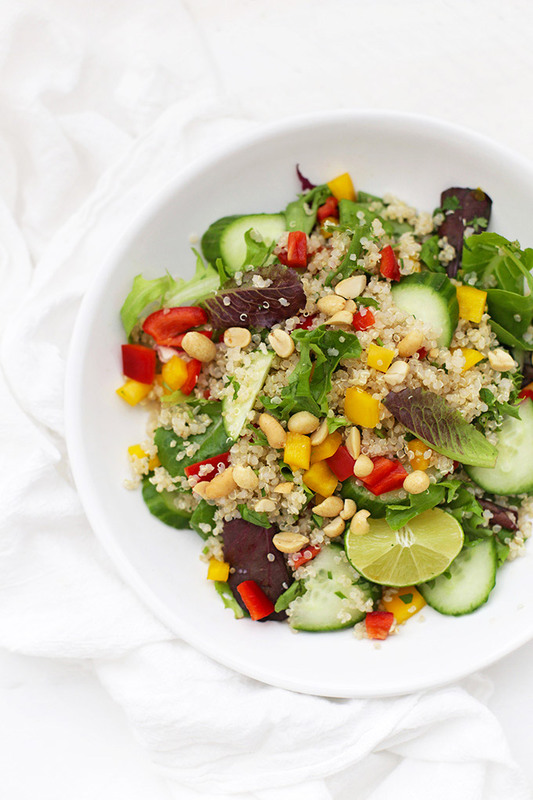 Then, layer quinoa (mixed with herbs, lime, and sweet chili sauce), bell peppers, cucumber, and greens. 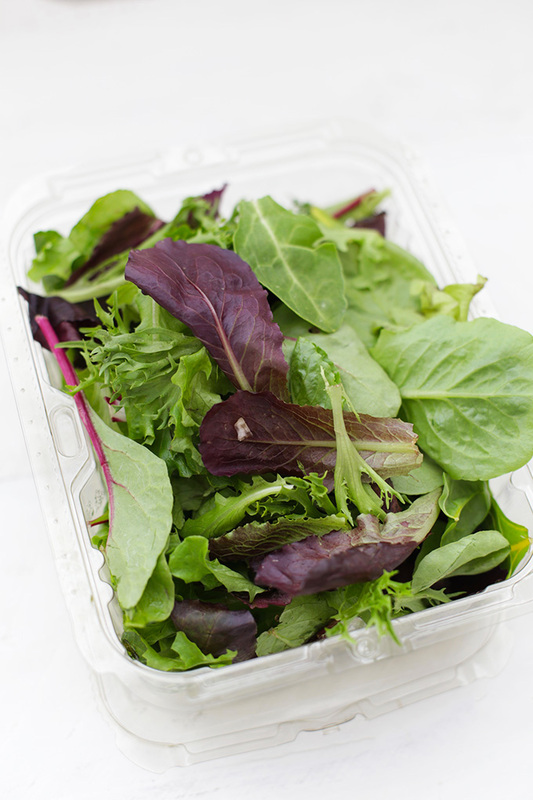 Seal with the lid (I love these reusable ones) and store in your refrigerator up to 1 week. Stir up with a fork before serving! Let quinoa cool after cooking. Stir in sweet chili sauce, lime juice, and fresh herbs. Stir bell peppers, cucumber, and spring mix into quinoa mixture. Toss to combine well. Drizzle with peanut sauce if desired. In a medium bowl, whisk together peanut butter, coconut milk, soy sauce/tamari, and syrup/honey until completely smooth. (If your peanut butter is cold, it may need to warm up a bit to get completely smooth in the sauce. If you’re having trouble, simply microwave it for 20-30 seconds and stir again), or use a blender or immersion blender. Layer peanut drizzle in the bottom of each jar. Add prepared quinoa. Add bell peppers, cucumber, and greens. Cover jars with lids and store in the refrigerator up to 1 week. Gluten free? Be sure to use gluten free tamari or coconut aminos in place of the soy sauce. Mix It, Blend It. Especially if you’re using a natural peanut or nut butter for the drizzle, you may find it doesn’t blend right away. Don’t panic! That’s just because it doesn’t have “extras” in it that stabilize it. You can just keep whisking, warm it a bit in the microwave to help it along, or just toss your peanut drizzle ingredients in a blender or use an immersion blender to get the job done. Your choice! This sounds so fresh and delicious! I love Spring Rolls, but feel guilty about any thing deep fried. Problem Solved! What a gorgeous looking salad. I’m wondering what tips you can share for extending cilantro’s lime. Ours always goes slimy too quickly. Emily – Here’s my best tip. It works AMAZINGLY well. Rinse your whole bunch of cilantro when you get home. Let it dry somewhat. Put it in a jar or cup with water like a bouquet of flowers and cover with a loose plastic bag. Store in the refrigerator and change the water every few days. It’ll last anywhere from 1-2.5 weeks! We had burgers and fries for lunch so I was wanting a lighter dinner and saw this salad. I was too lazy to make the dressing and used Trader Joe’s Spicy Peanut Dressing instead. It was SOOOOO good! Like I can’t wait till tomorrow to eat the leftovers good and just might eat them for breakfast. I added mango and avocado since I had them and oh boy, it was delicious! Oooh, that sounds so good! I’ll look for that dressing next time I’m there!